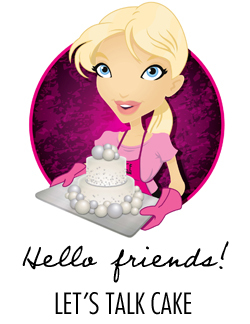 fondant | Talk Sweet To Me! 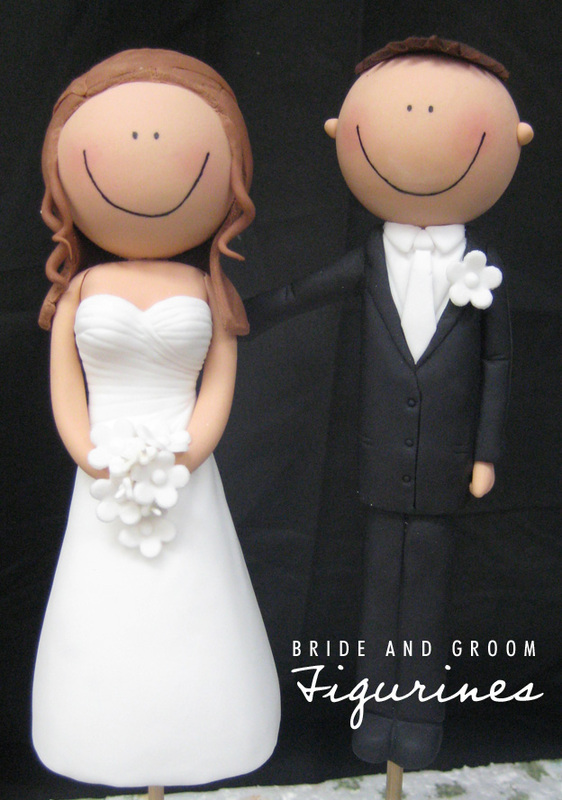 Bride and Groom and Stilettos! Since I promised a posting about stilettos this week, I will break my last week of work at Planet Cake into a couple different postings. 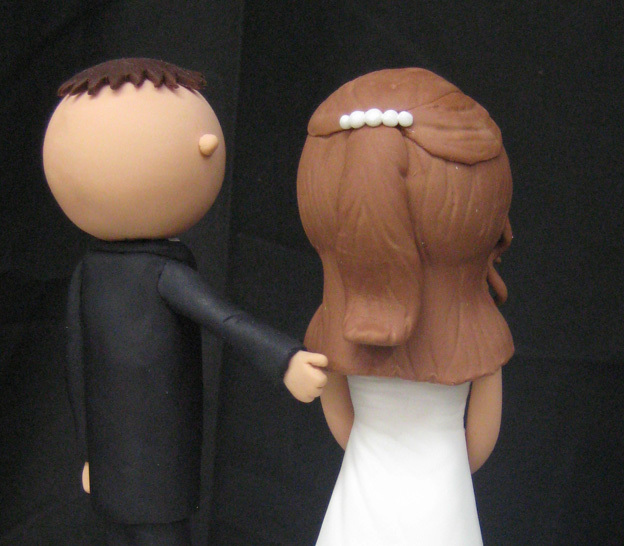 Here I’ll concentrate on the stiletto and my first set of bride and groom figurines. 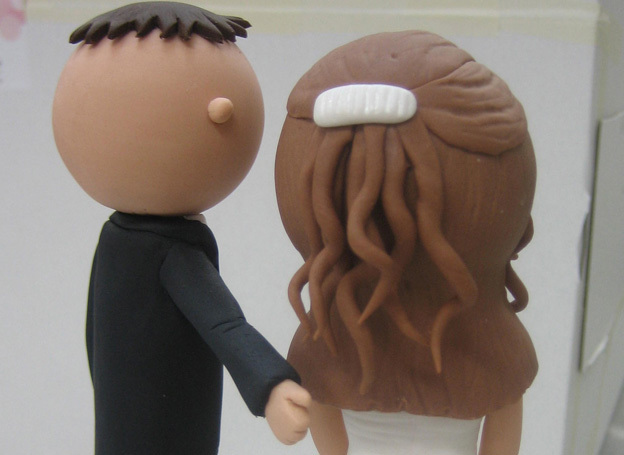 Planet Cake always obtains information about dress, hairstyle, colors, and more from clients so the figurines can be customized to follow the hairstyles, hair colors and dress/tuxedo of the bride and groom…so I picked out a couple images to learn from! 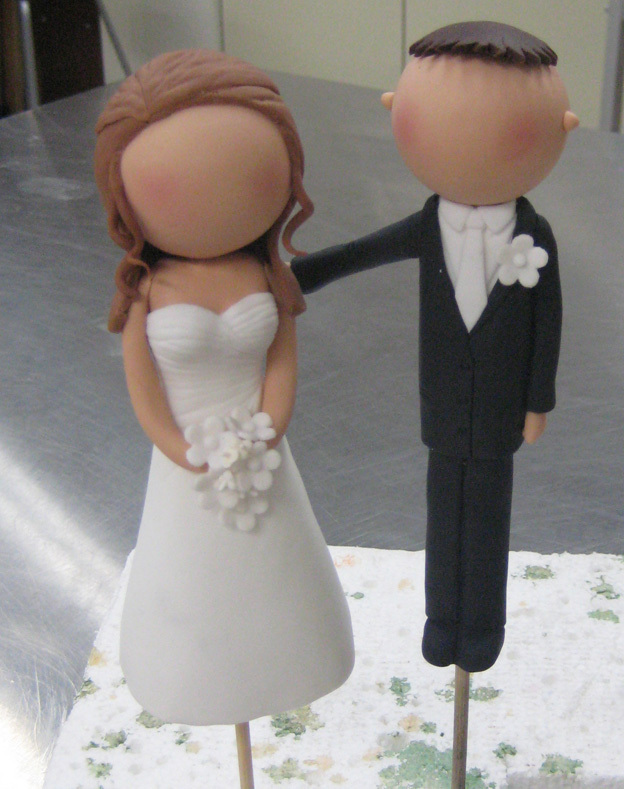 Then put the groom’s shirt and pants on, gave him some hair, and added a jacket, tie and flower. The groom was nearly done! The bride took a bit more work. After letting the chest and back dry overnight, I put on a piece of white icing for the dress and carved the flow of the fabric into it. …which took me two tries to get right too. The first attempt was kind of a disaster, partly due to the difficult style (having it shown both up and half down in the picture added to the confusion! ), partly due to it being the end of the day and Handi and I each lacking concentration. 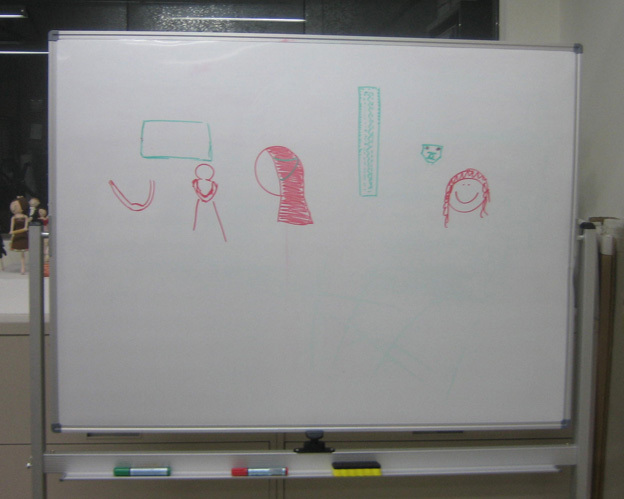 We even had to make diagrams on the white board! I stayed for a while after work was over to give it my best shot, but it still came out looking a little bit like Medusa was starting to emerge from the barette on the back of her head. and a face or two! So, there is room for improvement…it would be nice to make one attempt at everything and have it turn out right the first time! I wish I had some more pictures of the stiletto in progress, but my description will have to suffice for now. I chose a picture out of Anna-Maria’s fabulous shoe book…a Manolo Blahnik, of course. I figured if I can’t afford a real one (let alone a pair! 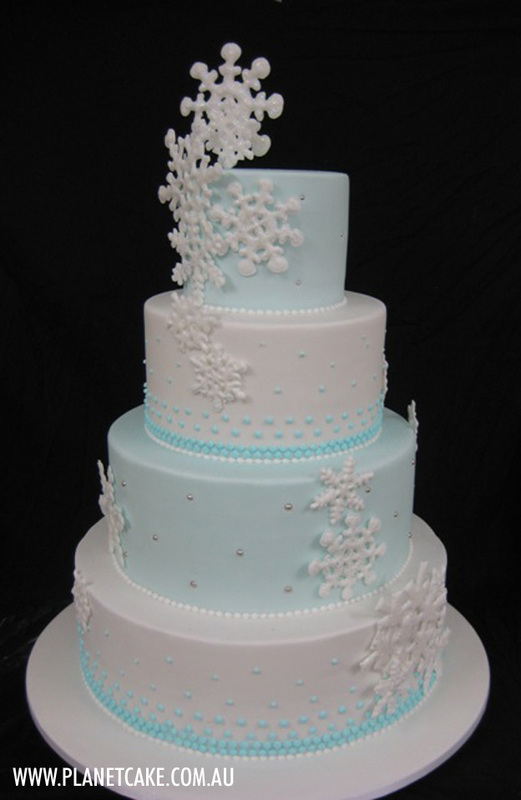 ), I might as well make myself one out of icing. Anna-Maria is more obsessed with shoes than anyone I know, except perhaps Carrie Bradshaw. She had a lot of great models for me to look at, including a few different heel types carved out of styro, and two different shoe types (pointy-toed and a regular rounded toe). The first thing I did was cut the sole of the shoe out of very thin corrugated cardboard, with the “grain” of the cardboard running from the toe to the heel of the shoe. This was so I could insert #26 wires into the cardboard in about 3 different places, which made the cardboard hold its shape when I bent it. 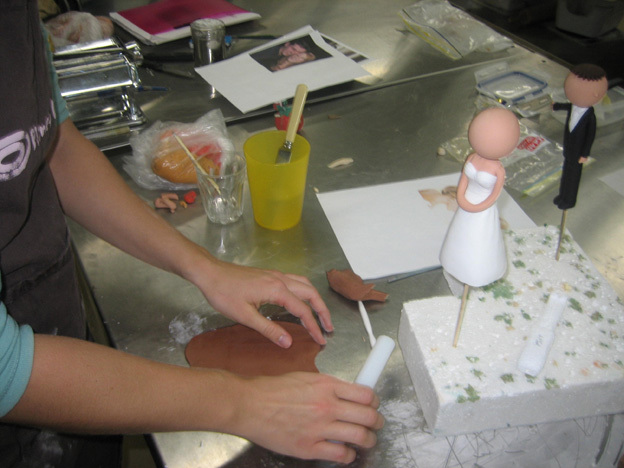 Next, the heel was carved out of Styrofoam, and a small bamboo skewer was inserted and glued into place. 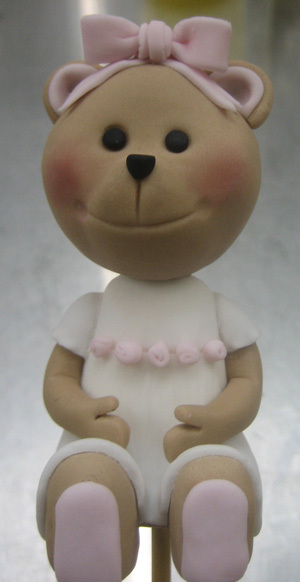 This gave me something to hold onto, and would be used to insert into the cake to hold the shoe in place. The top of the sole of the shoe was covered first, with both black and a beige color to match the picture. Next, I used strips of acetate (cut in the pasta machine to make sure they were all even) to construct the straps. The straps were attached to the bottom of the shoe with masking tape and held together where they met on the top of the foot with double sided tape. Once they were all in place, it was time to cover the bottom of the shoe, leaving a place for the heel to be glued on. Both colors were then used to cover the heel, and icing strips were used to cover the acetate straps, secured with a bit of gel. Next I glued the heel to the cardboard (covering the styro with masking tape first so that it wouldn’t melt) and covered the sides of the shoe with a very thin strip of black icing. A label printed on rice paper and a bit of bling were the finishing touches. 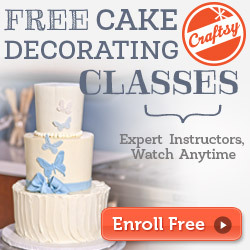 This entry was posted in Decorating Tips & Tricks, Fondant, Inspiration and tagged cake decorating, fondant, tips on April 15, 2014 by TalkSweetToMe. 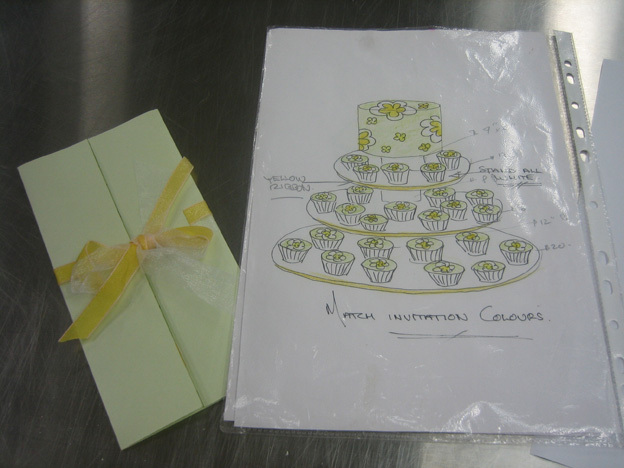 On Thursday we try to finish all of the cakes and package and label them for delivery or collection. 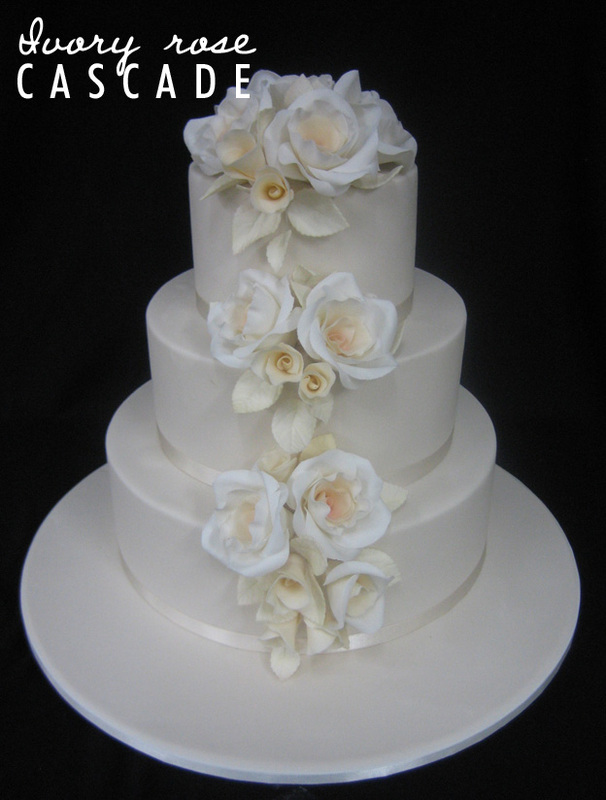 In the morning I finished the orange cake with piping and arranging the flower spray on top of the cake. The flowers had to be dyed orange and yellow and then dusted in order to make them “glow” from the inside. The spray was arranged on top in a teardrop shape, starting with the largest flowers first and working from largest to smallest after that, generally alternating colors along the way. Then leaves were added, which helps to hide the wires. 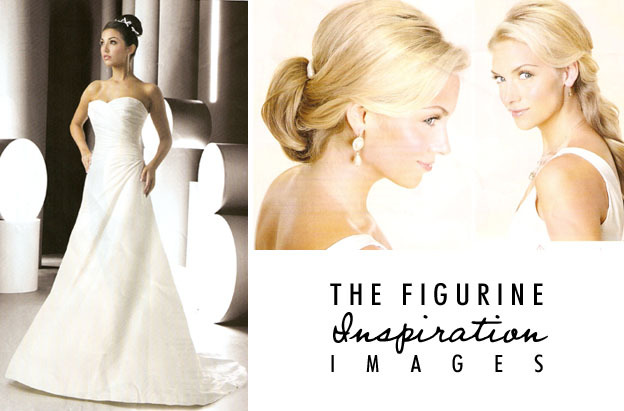 Does it look like the design inspiration?? 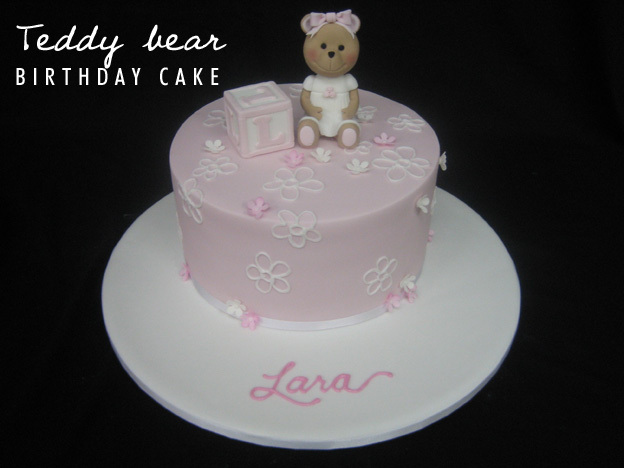 Next Handi demonstrated how to finish the teddy bear funky, which will be used on a cake for next week. 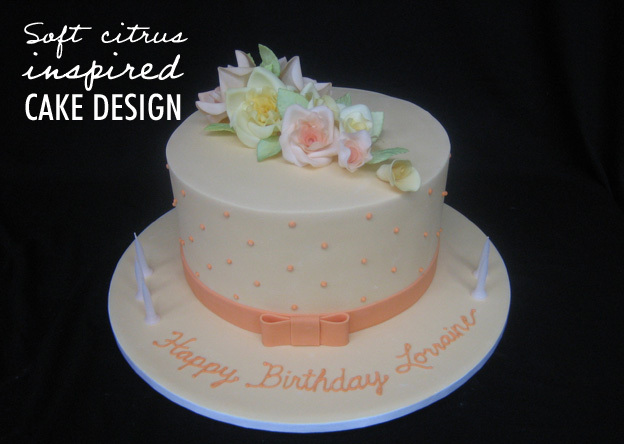 The Funky was placed on the cake with the block, the flowers piped on, and the message added to the board. 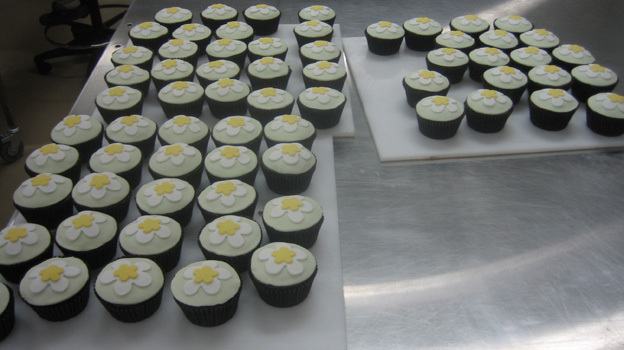 In the afternoon, the 65 cupcakes were ganached and decorated. 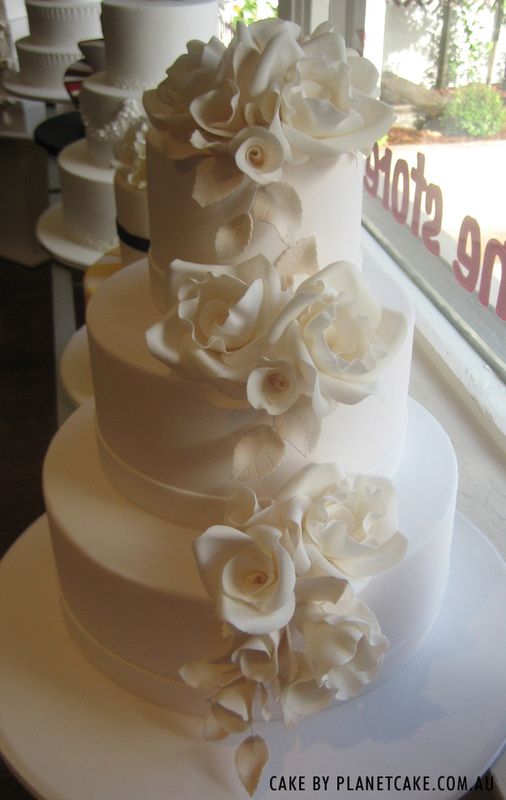 …I completed a 3-tier cascade. This is yet another thing that is trickier than it looks. Handi brought one down from the showroom for me to work from. Friday is generally last-minute finishing and preparation for the next week. 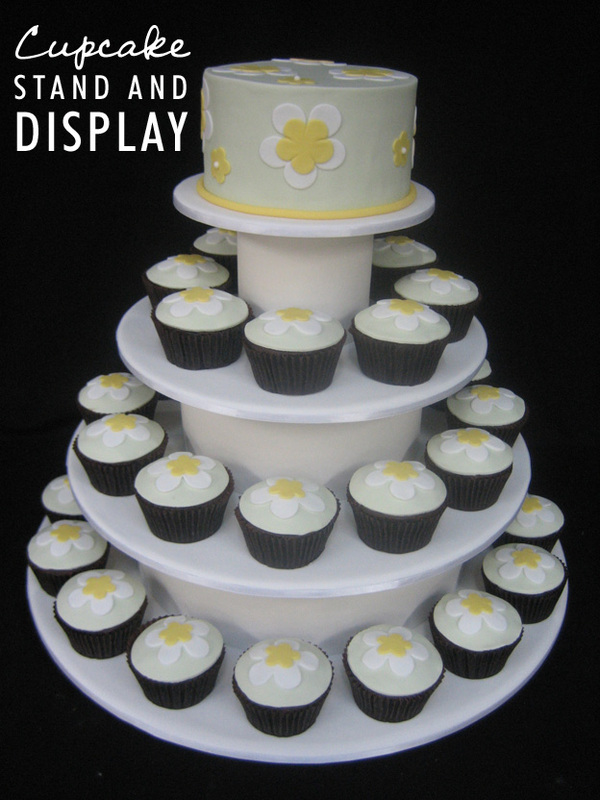 This morning I finished up my cupcake stand and boxed it for delivery. 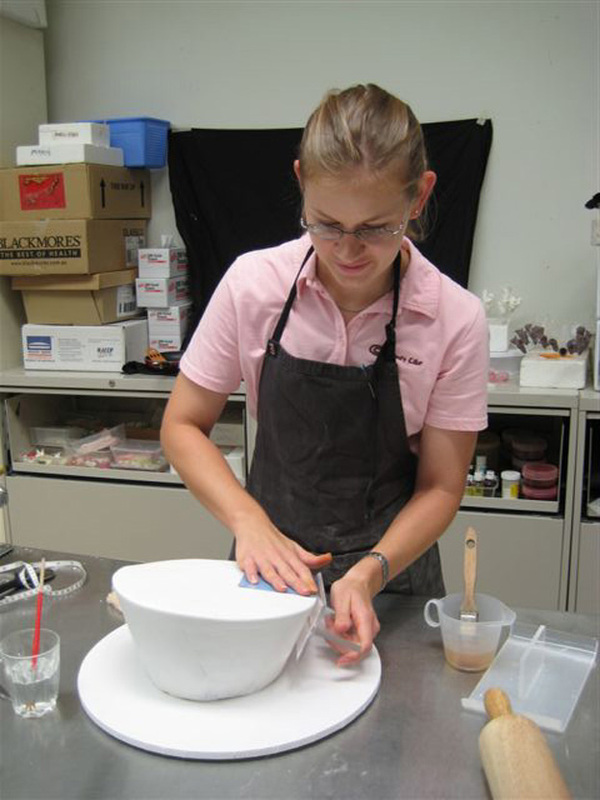 After finishing this week’s cakes, it was time to organize the cakes for next week with Anna-Maria and make some ganache. Fifteen batches of dark chocolate ganache, and sixteen batches of white chocolate ganache. We went through a lot of chocolate today. Before lunch, Paris gave me a constructive critique of the cascade I completed on Thursday. It was really helpful to help me see what needs to happen next time. More flow, less bunching! Next we started preparation for next week’s cakes, but before getting too far into it, a slight emergency arose. 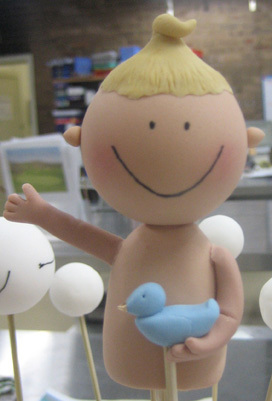 Paris received a call from a customer who said that that the hair on the Funky baby that was delivered was smashed. Luckily we had another Funky just sitting around waiting for something to do (the one I started on Tuesday), so I gave him some arms, a dye job (brown to blonde hair!) a new pet duck, and a face. 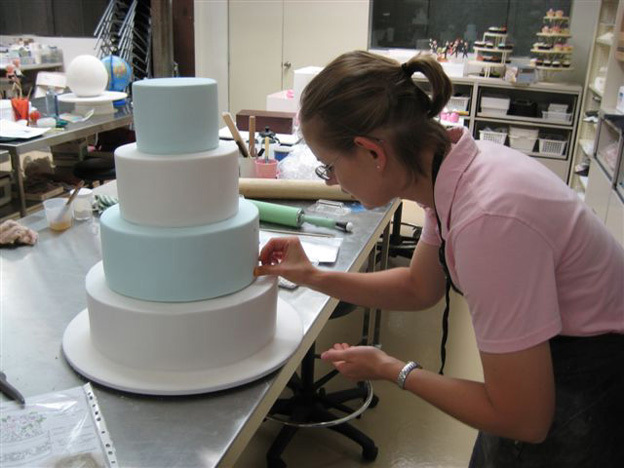 This entry was posted in Cupcakes, Decorating Tips & Tricks, Fondant, Inspiration, Story of a Cake and tagged cake, cake decorating, cake design, cupcakes, fondant, fondant cake, inspiration cakes, tips, wedding cake on March 28, 2014 by TalkSweetToMe. Today was pretty full-on. In a very good way. 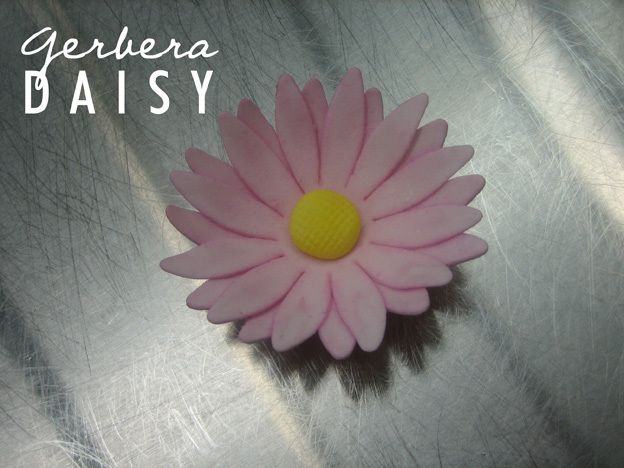 After completing a Spotty Present Box cake, I finished the gerbera daisies that were started last week. 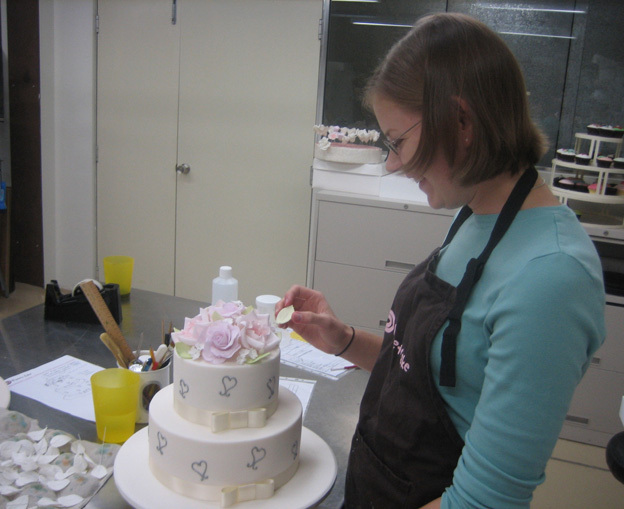 The first layer has to dry before the second layer of petals is put on, and after cutting out and preparing the second layer it must immediately be placed on top of the first layer so that it will form to the shape of the first dried layer. After letting the new layer dry for a little while, I dipped them in the colors (orange, yellow, and magenta today). 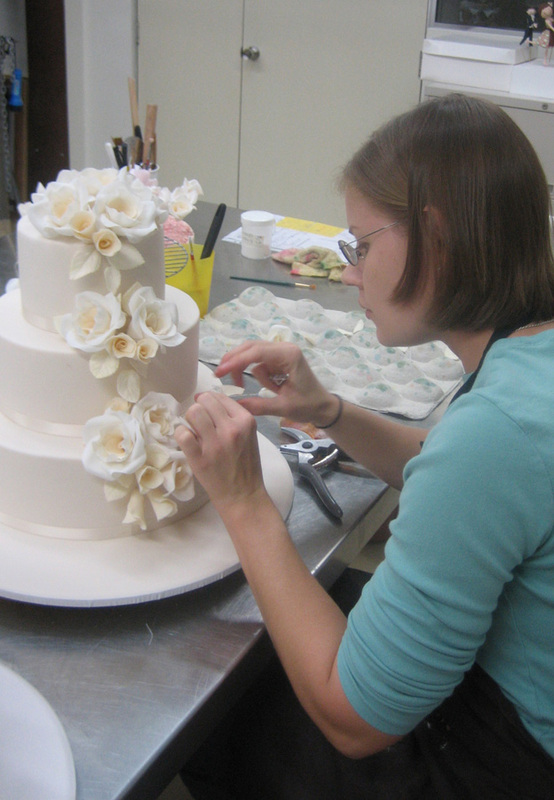 The middle was made by rolling a small ball of white icing, pressing it with a grid-type fabric to make the pattern on top, and then dipping it into the yellow solution and placing it right onto the flower while it was still wet. But first, morning tea. Peanut butter and chocolate is one of my favorite flavor combinations to soothe my (very unfortunately) raging sweet tooth. So you can imagine my utter astonishment when someone said that they had never experienced this before. I brought in some Reese’s Peanut Butter cups from the candy store near my apartment that happens to sell American candy at over twice the price one would pay for the same thing at home. But it was worth every penny (and every calorie, too)! 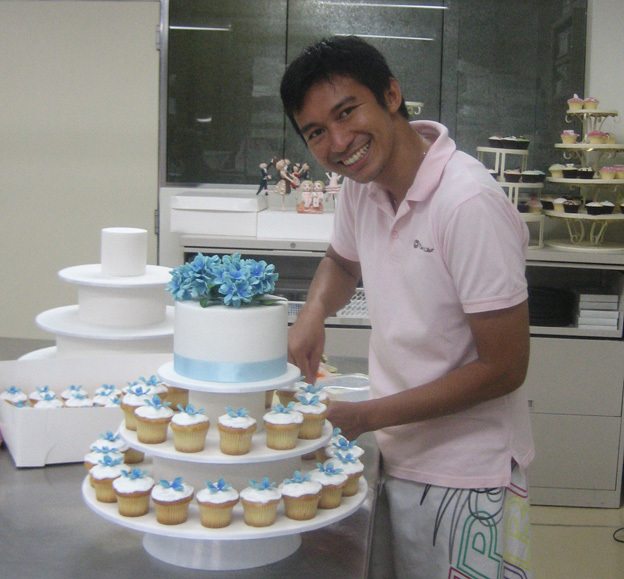 After replenishing our energy, I talked with Handi about how to construct tiered cakes and helped cover a large base tier for a 4-tier cake he was working on. I also helped put the other layers together…quite exciting to work with multiple tiers! 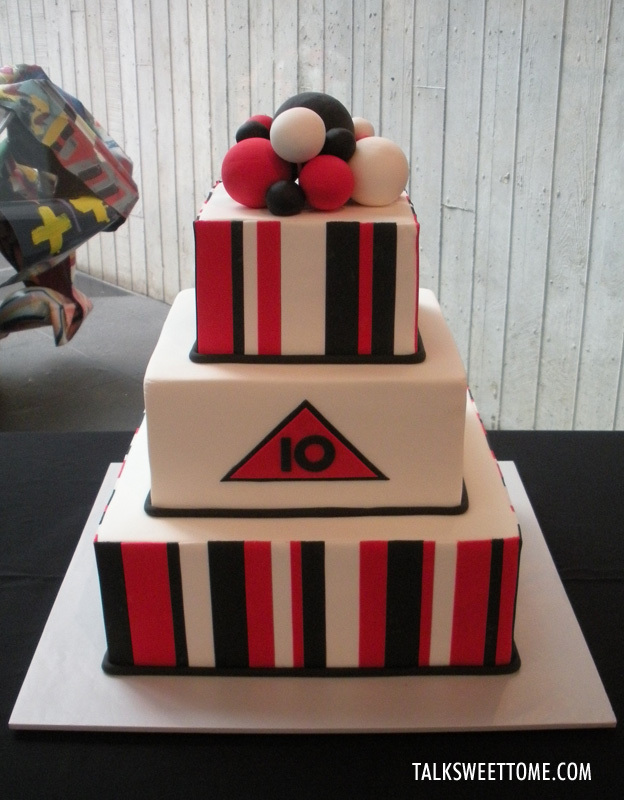 Handi worked some more magic, and the cake was complete! The next cake was by far the highlight of my week. I’ve wanted to work on a Madhatter cake for quite some time now, so it was fantastic to finally get a chance to do it! 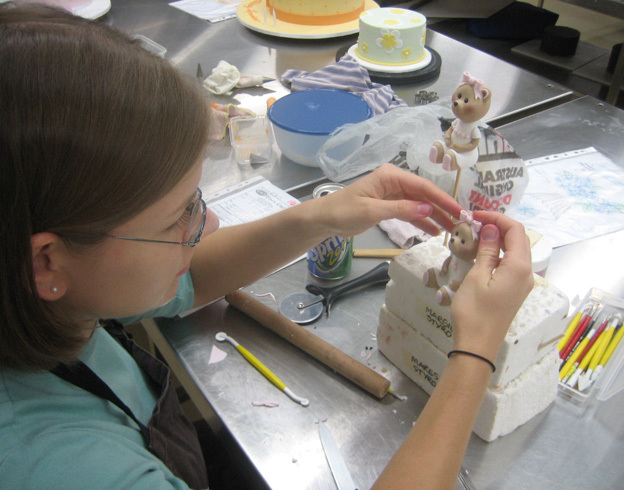 Plus, it would give me a bit of a head start when I did the Madhatter course the next weekend. 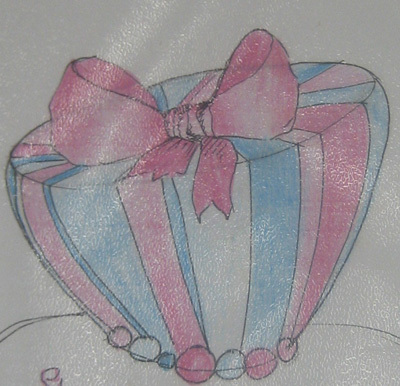 Here is the drawing that I worked from – a one-tier, striped Madhatter cake. 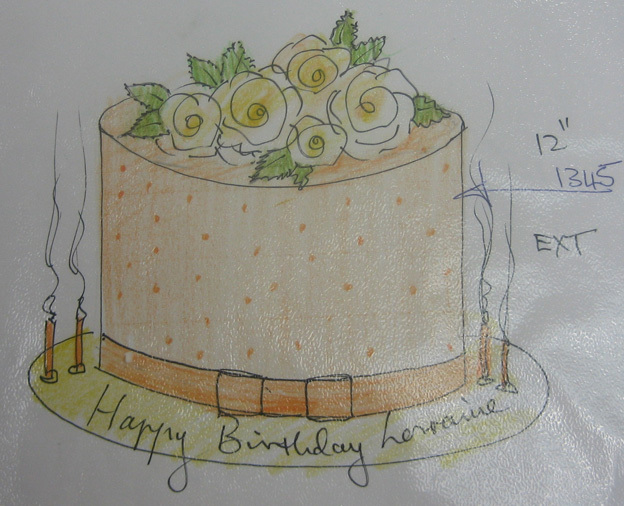 I started out covering the cake with white icing for the base layer. It is best to let it dry a bit before proceeding with the stripes. Then it was time to put on the stripes! Then just a bit of finishing – the bow, the balls around the base, covering the board, and piping the message. With all of that fit into one day at Planet Cake, it was a long one. 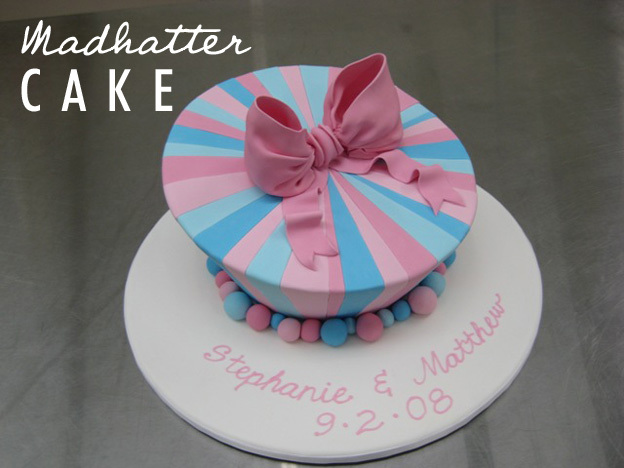 Putting the stripes on the Madhatter cake took quite a long time, but I had a blast doing it. So I didn’t actually leave until 8pm, right when it started pouring down rain, but that was partly due to the break I took to look at Margie’s stunning photos from her recent travels in the USA through Utah, Colorado, California, and some other places out West. It was fun to see, but made me miss home. Sniff, sniff. 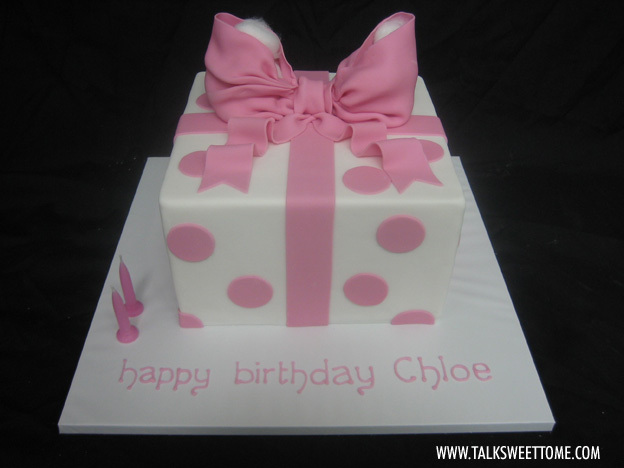 This entry was posted in Cake, Decorating Tips & Tricks, Fondant, Uncategorized and tagged bold cakes, cake, cake decorating, cake design, fondant, fondant cake, tips on March 7, 2014 by TalkSweetToMe. 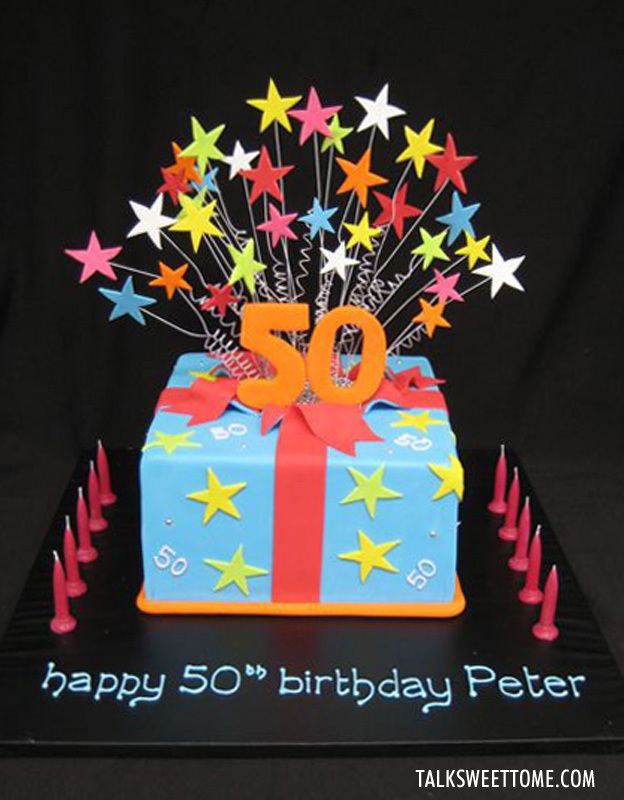 A rolled fondant rope can be used to create a clean line around the base of a cake (such as on the Exploding Stars cake or black and red anniversary cake). 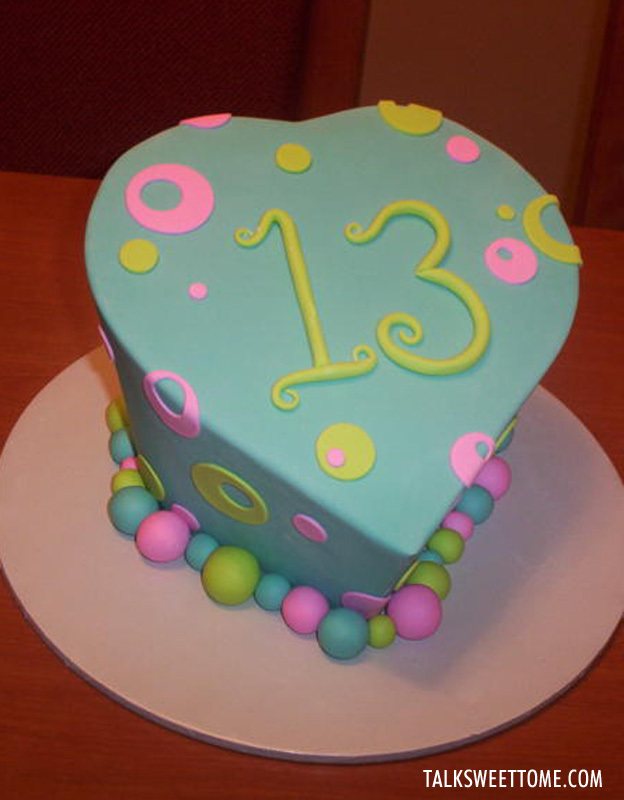 Two ropes can also be twisted together to create the braided rope seen around the base of the butterfly cake, or use fondant rope to create the numbers seen on the 13th birthday cake. There are so many possibilities! 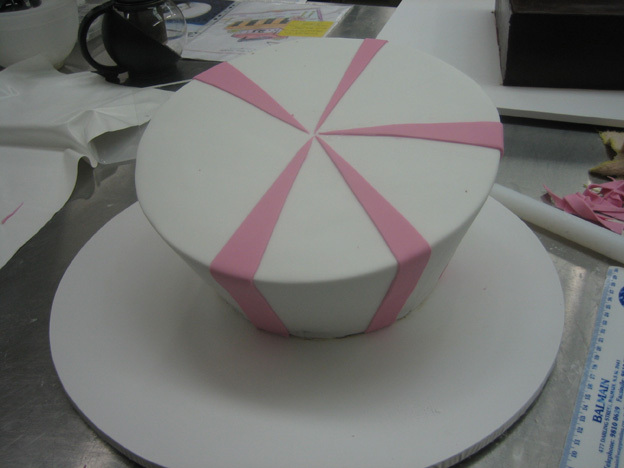 To roll out an even rope from fondant, all you need is some fondant, a paintbrush and water, and a fondant smoother. 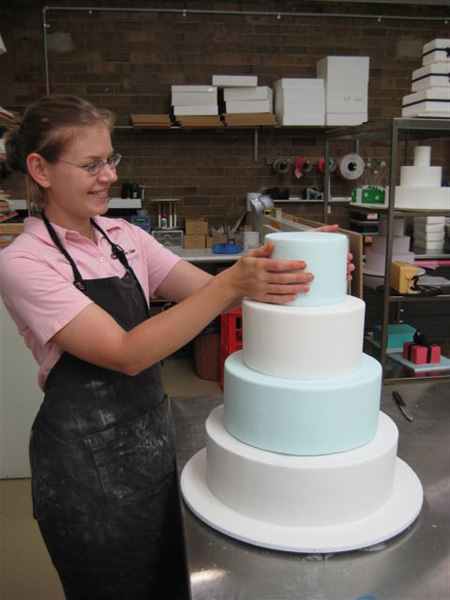 If you are using the rope around the base of a cake, be sure you have measured how long you need to make the rope to reach all the way around the cake. 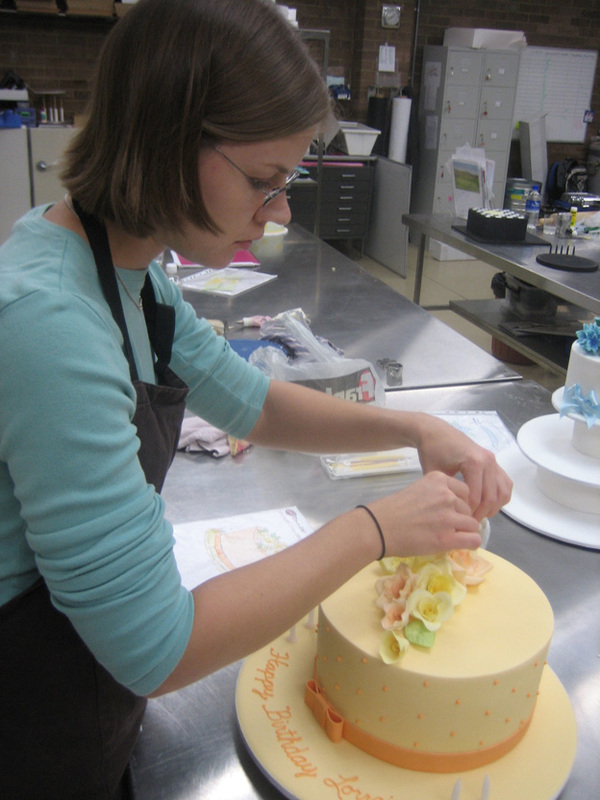 To start, roll the fondant in your hands to create the basic elongated shape of a rope. 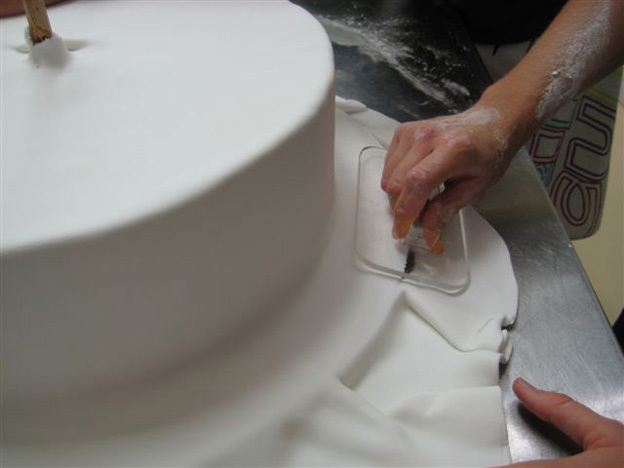 Set this on your work bench, and use your fondant smoother to begin rolling the rope back and forth, pulling slightly out to the sides to elongate the rope with your free hand. 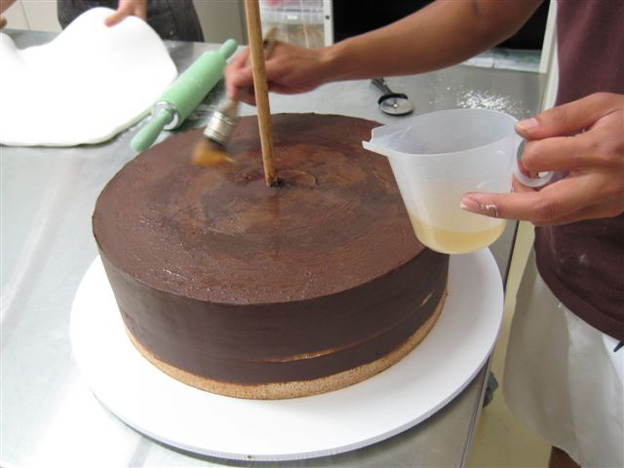 If the icing begins to slip under the smoother or does not roll easily, use your paintbrush to paint a very thin line of water (you only need a little bit!) 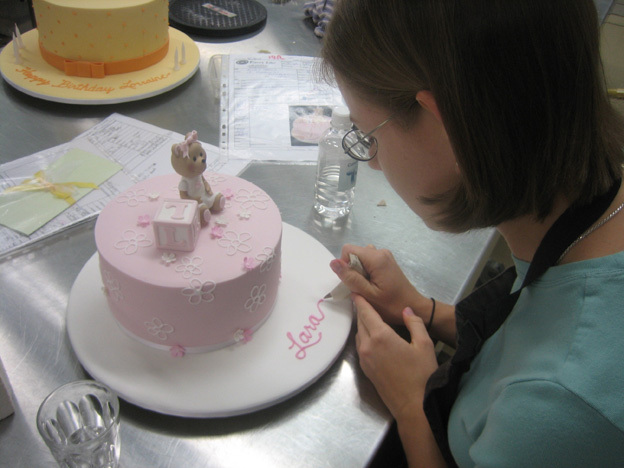 right next to and parallel to the rope, then use the smoother to roll the fondant rope across the water. 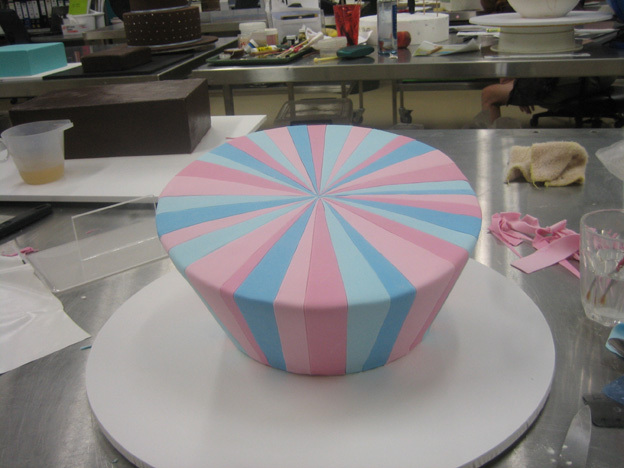 This will make the fondant a little bit stickier, which will help it “catch” and roll easily underneath the smoother. 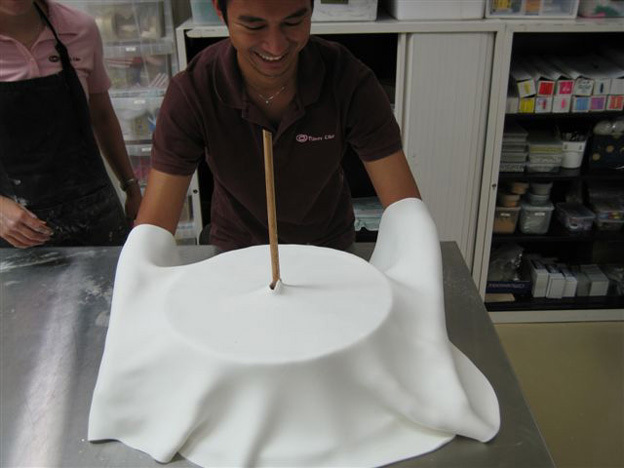 Continue to roll and stretch the icing rope until it is the desired width and length for your cake. 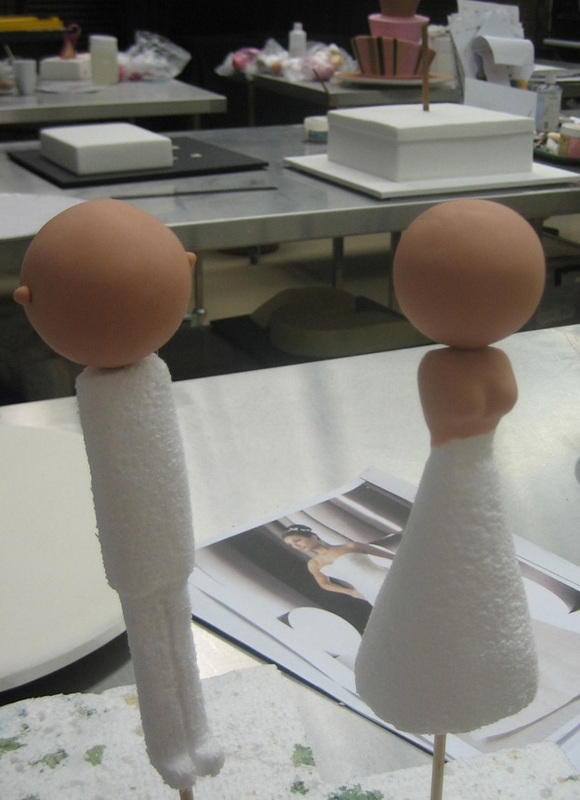 Sometimes it is easier to use two fondant smoothers, especially toward the end when the rope gets very thin. 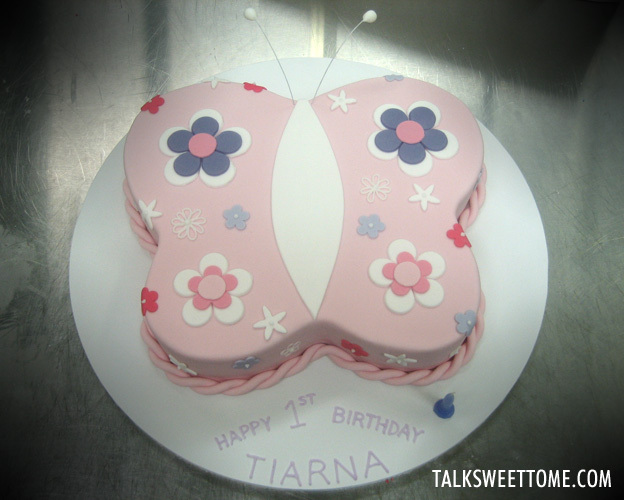 This entry was posted in Cake, Decorating Tips & Tricks, Fondant and tagged cake decorating, fondant, tips on May 10, 2013 by TalkSweetToMe.